Effects of World Events on Labrador. Down North on the Labrador Circuit: The Court of Civil Jurisdiction 1826 to 1833.
Henley Island by Rev. William Grey, ca. 1857. Drawing by Rev. William Grey. 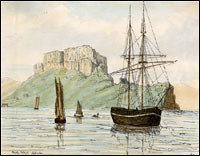 From William Grey, Sketches of Newfoundland and Labrador (Ipswitch, Eng. : S.H. Cowell, Anastatic Press, 1858). with more information (147 kb). "Eskimo and Nascopi", author unknown, ca. 1861. From Charles de Volpi, Newfoundland: a Pictorial Record (Sherbrooke, Quebec: Longman Canada Limited, ©1972) 91-92.
with more information (124 kb).